This page features solar elongation charts for all the planets, plus Pluto, Ceres and Vesta. See below for a 10 year version. 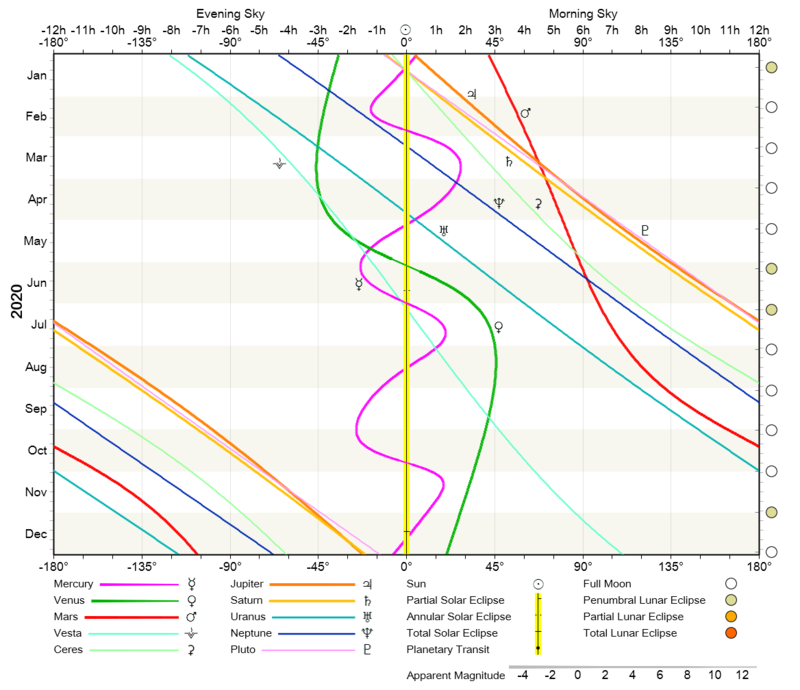 The above chart shows the solar elongation of every planet; that is, the angle between the planet's and the Sun's position over time, projected on the ecliptic, for this year. The yellow line in the middle represents the position of the sun. So right after sunset the left half of the chart is above the horizon, and just before sunset the right half. In between the window of visibility shifts out of the left and into the right side at a rate of 15° per hour. Note that the position of the ecliptic in the night sky depends on your location on the ground, but the position of the planets along the ecliptic is the same from every location. If you know where the ecliptic is from your location, find the current date on the chart, and you know where to expect each of the planets along the ecliptic relative to the Sun. When the planet crosses behind the Sun, it is at conjunction, when it crosses over at 180° it is at opposition. For the lower planets Mercury and Venus upper and lower conjunction are shown as the line crossing behind or in front of the Sun. The planet-tracks are color-coded and marked with their symbols according to the legend, the line-widths are proportional to the planet's apparent magnitude at the given time. The vertical tick-marks denote weeks, each tick lies on a Sunday. The large ticks and white circles on the right side mark full moon dates. Eclipse events are also marked according to the legend. A caveat: Be aware that some of the bodies, notably the smaller ones, are much more inclined from the ecliptic than the biggies, and therefore the projection on the ecliptic much less accurate. 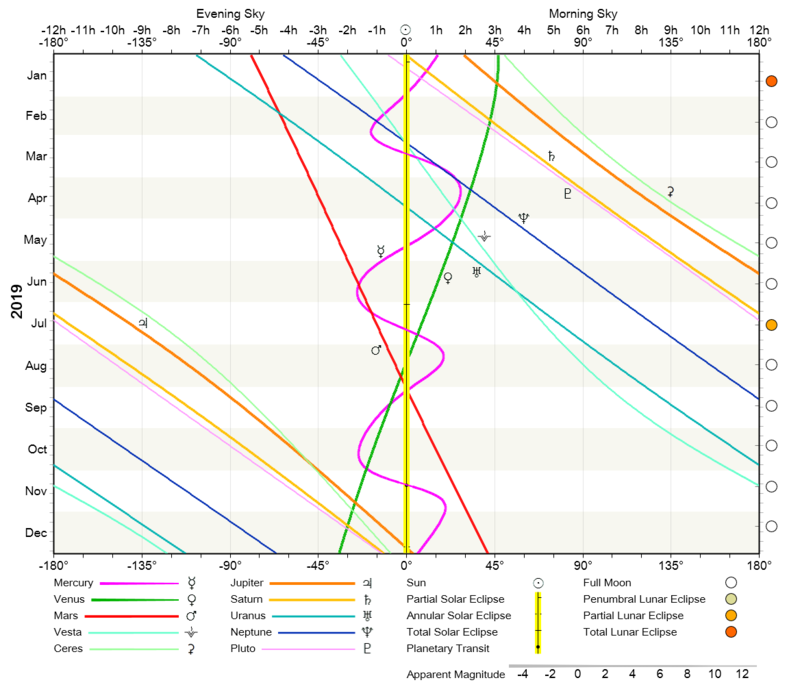 But what I like about this chart is the easy overview it gives on mutual and other events like conjunction, opposition and eclipses, all in one chart. The Elongation-Chart for the decade from 2019 to 2028. Bonus feature: Same chart, but for ecliptic longitude.